Three funiculars for one ! 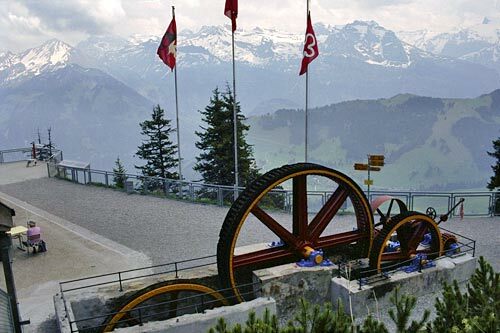 Located at Stans, south of the Lake of Lucerne (Vierwaldensee), the Stanserhorn is a 1898m summit. 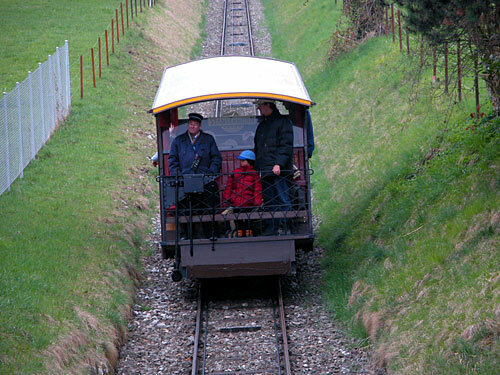 The funicular was built in 1892 and 1893. The distance was too long to reach the summit from Stans with one funicular, so it was decided to divide the distance in three sections, in fact three concatenated funiculars and two intermediate stations for transfers between the sections! The first section, from Stans (alt. 450m) to Kälti (alt.714m), rises gently (17%) through fields and pastures. 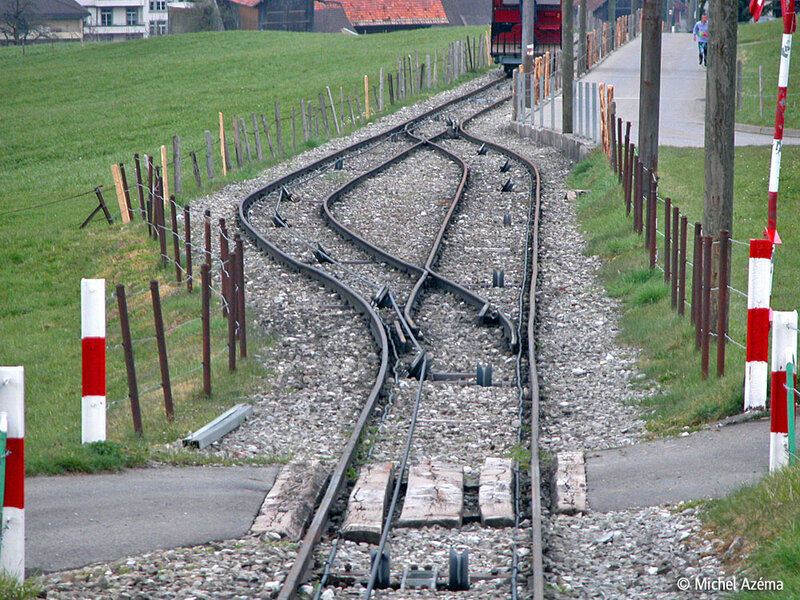 There are thre level crossings in the middle of this section, which is pretty rare in the Funiculars World! 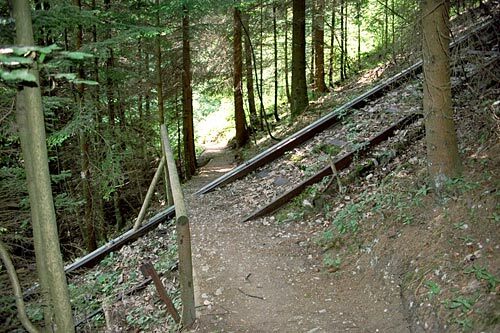 The second section runs entirely through the forrest into a narrow pass with a 52,5% gradient. When the line emerges from the forrest, it arrives at the Blumatt transfer station (alt. 1221m). From this point, the third section climbs through the pastures like a big S with a 63% average gradient. 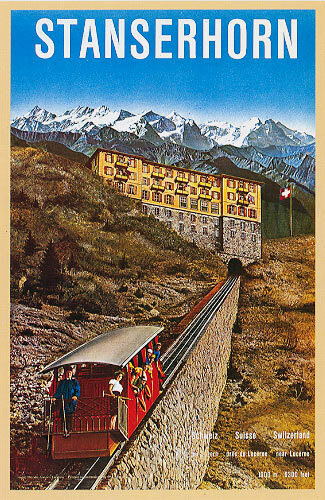 The line goes through a tunnel (length 140m) before reaching the top of the mountain arriving at the basement of the Stanserhorn Hotel (alt. 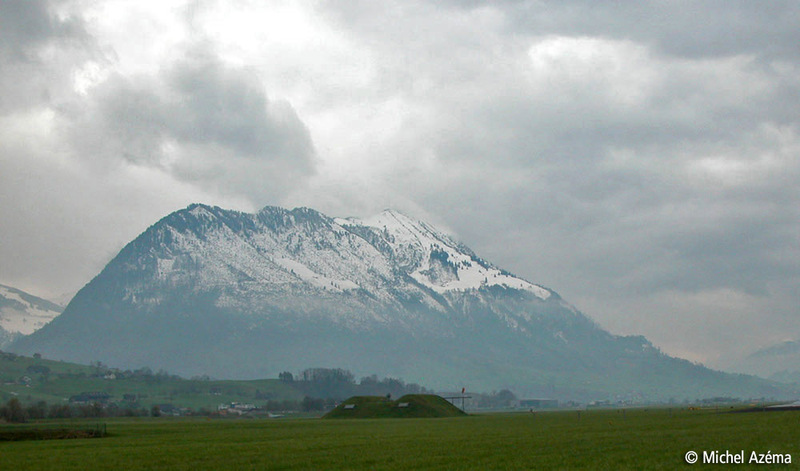 1851m). In 1974, a big storm striked the hotel which was completly destroyed as was the engine of third section. 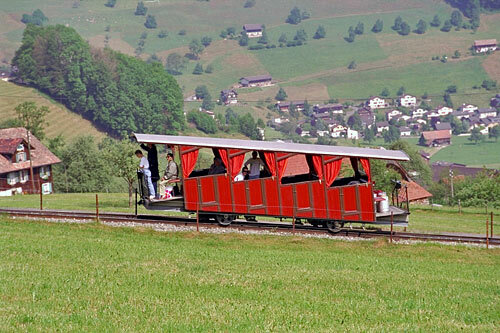 The use of the funicular was stopped. 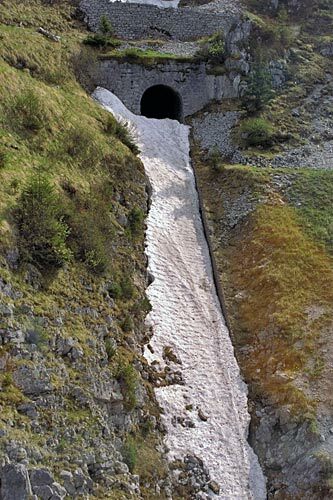 An aerial cable way (teleferic) was built between Kätli and the summit to completly replace the second and third sections which were left as they were. 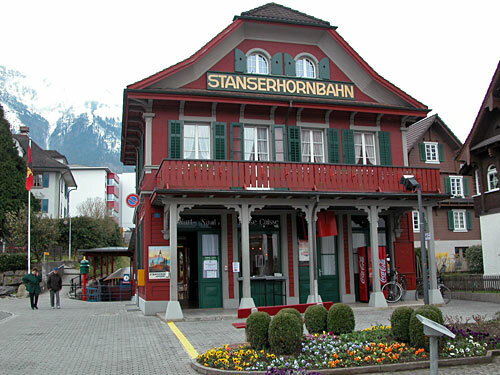 In 1975, the Stanserhon Bahn restarted with only two sections: Stans-Kätli with the last funicular section and Kätli-Stanserhorn with the aerial cable way. 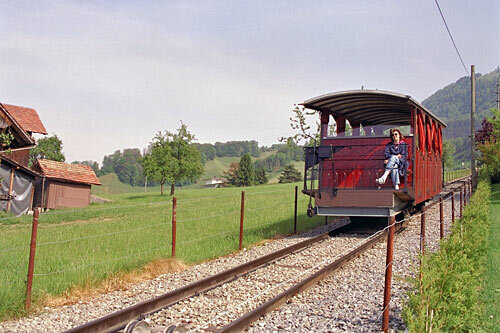 Today, the first section is still in use with the original wooden cars. Remains of the two other funiculars sections are still visible, quite intact. Rails and sleepers are still there, the cables and their rollers were removed. The second section is completly covered by the vegetation. The building of the Blumatt transfer station is intact. Two original cars are still under the roof covering the transfer platforms but without any wooden parts. 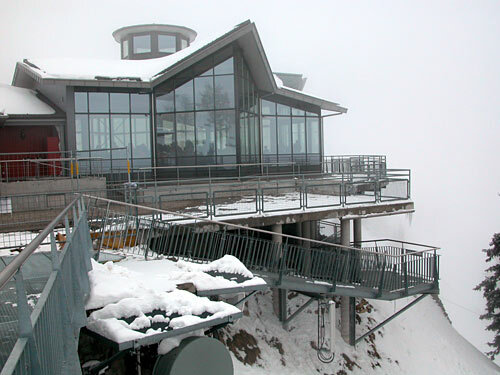 The engine and the pulleys were removed and are now displayed on the top of the Stanserhorn near the restaurant which replaced the hotel. 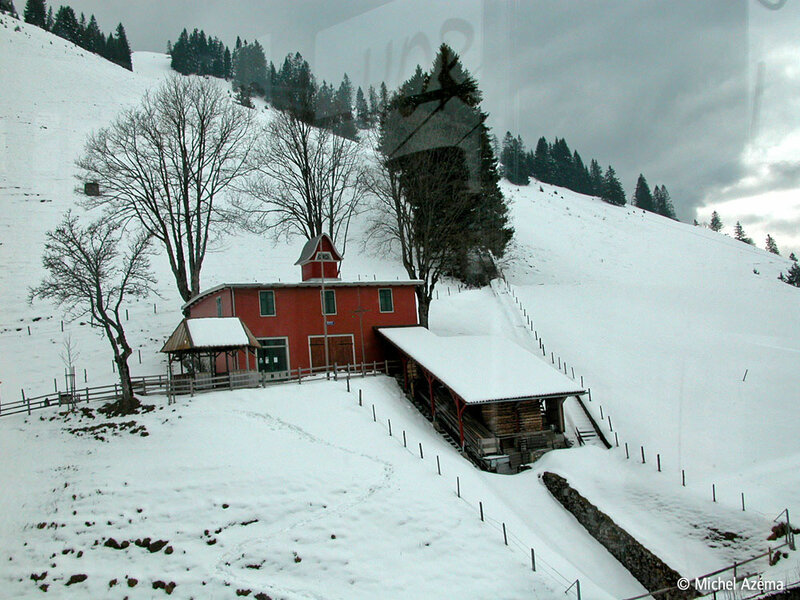 The third section has some small walls (dams) across the track to prevent avalanches. The tunnel is obturated. As funicular lovers we may regret that an aerial cable way was choosen in the 70's instead of rebuilding of the funicular sections. 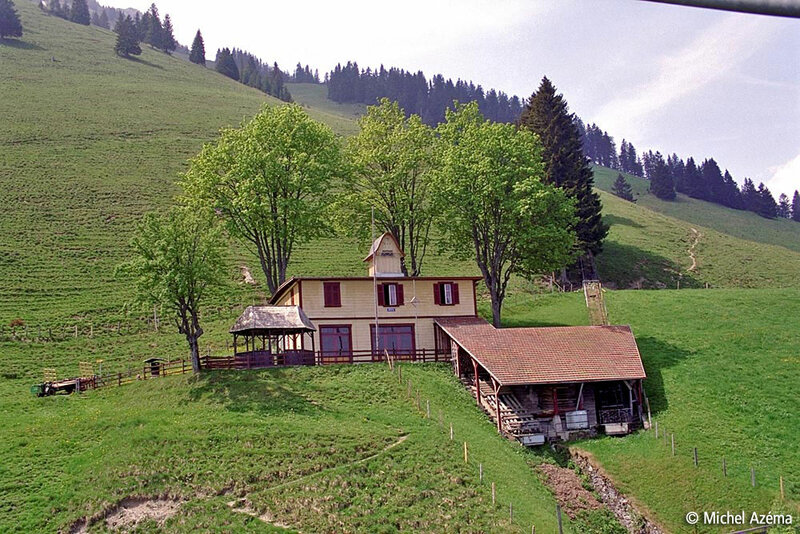 The teleferic is the main predatory of the funicular, but without its charm and attraction. Blumatt station 1221 m ( May 1992 ) between the disused second and third sections . Note the two old carriages under the roof of the transfer station. Blumatt station 1221 m ( 12 April 2003 ). Note that one carriage has disapeared under the roof! Opening of the new Stanserhorn aerial cable car. 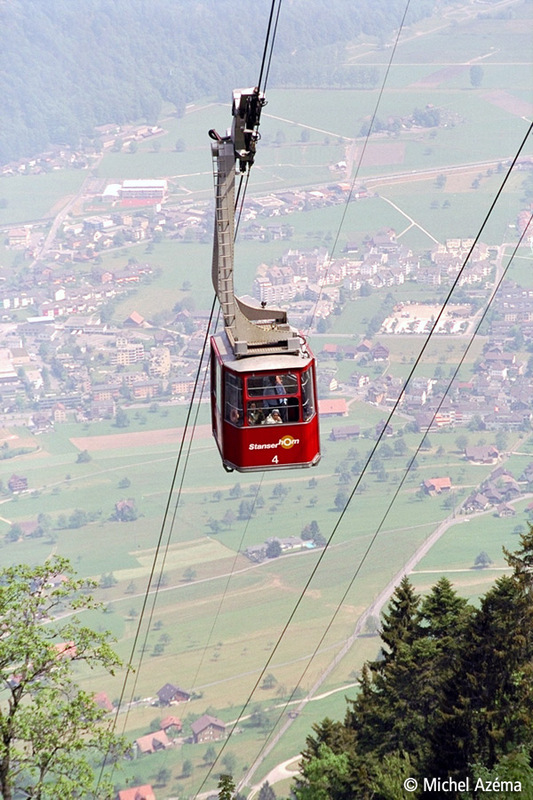 it is quite a revolutionary aerial cable car: the CabriO® from Garaventa. 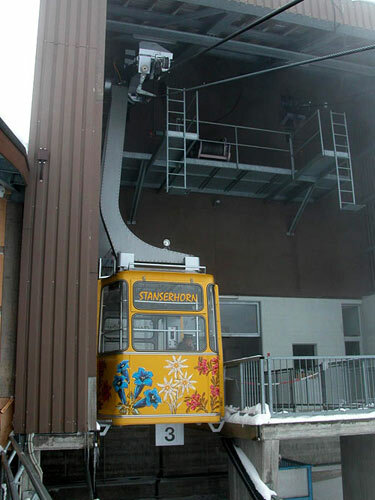 The CabriO® is a Funifor aerial cable car composed of double deck cabins. The top deck is an open air deck on which the passengers are able to feel the sheer drop and the fresh air. The open deck communicates to the bottom deck with a little stair. The open deck has a capacity of 30 passengers and 60 passengers for the bottom deck. The CabriO®, as every Funifor, is suspended onto two carrying cables and pulled by two tractor cables. The cabins are not suspended anymore but they are supported by the cables which are at the middle level between the two decks. Since 1975, these 2 sections have been replaced by an aerial cable way.